1500 years after it was made a metal detectorist has unearthed the rare 6th century Gold Anglo Saxon pendant featuring images from a Byzantine coin. Experts believe the pendant to have been made in France and has an image of Emperor Justinian depicted on it. Godfrey Pratt found the pendant in a field near Attleborough in Norfolk. Godfrey Pratt’s Rare Gold Anglo Saxon Pendant in the soil. When Pratt first saw the gold pendant in the hole he thought it was a bottle top, but after closer inspection he realised this was something far more important. Godfrey has been metal detecting for around 6 years now and is said to be known at his club as the “King of Bling” due to the many trinkets he has found. This however was his first gold find. 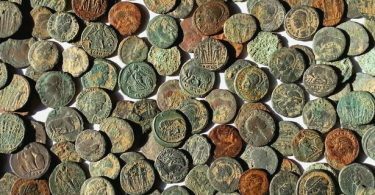 The Norfolk Historic Environment record has been notified of the discovery along with the counties museum. FLO officer Adrian Marsden has confirmed the find to be very rare and made from a high purity of gold. 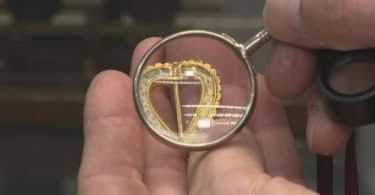 The rare pendant found in Attleborough, Norfolk has been handed over to the coroner and will then go along to the British museum for a valuation.